This 1865, hand-colored engraving by A. H. Ritchie is entitled Lady Washington's Reception and is based on Daniel F. Huntington's original painting "The Republican Court in the Time of Washington, or Lady Washington's Reception Day." A.H. Ritchie, the engraver, was one of the best historical printmakers of the mid-19th century. He is particularly known for the clarity and richness of his engravings, and this fine image is an excellent example of his work. 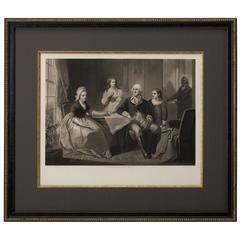 This print is filled with symbolism representing the regal status conferred on Martha and George in the mid-19th century. The elegance of the surroundings, the richness of the dress of those at the reception, and the formality of the situation and poses all recall a scene from any of the royal courts of Europe in the late eighteenth century. Indeed, it was likely the depicted refinement of the costumes and the obvious high status accorded to these American socialites that most explains the popularity of Huntington's oil painting and this elaborate print. On May 7, 1789, President George and Martha Washington attended a ball in their honor. The event provided a model for the first official inaugural ball, held to celebrate James Madison’s ascension to the office ten years later, which then became an annual tradition. 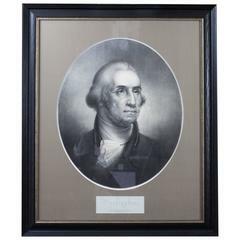 Washington was sworn in as the first president of the United States on April 30, 1789. A week later, an elaborate ball was held to celebrate the event in New York, the temporary headquarters of the federal government, in a building on Broadway near Wall Street. Unfortunately for the president, his wife Martha was unable to attend. She was still at their estate Mt. Vernon, in Virginia, where she was wrapping up business affairs before making the trip to New York. Washington arrived at the ball in the company of other American statesmen and their wives. That evening he danced with many of New York’s society ladies. Vice President John Adams, members of Congress and visiting French and Spanish dignitaries, as well their wives and daughters, joined in the festivities. Eliza Hamilton, wife of Alexander Hamilton, recorded her impressions of the ball in her memoirs, noting that the president liked to dance the minuet, a dance she thought was suited to his dignity and gravity.